This item’s concept is utterly original. Featuring an assortment of two designs, come these coat hangers. 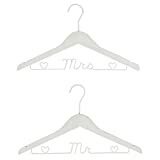 Each hanger has a piece of decorative wire under the hanger, with one saying ‘Mrs’ and the other saying ‘Mr’. These make the perfect gift for newly-weds and love birds, or as pre-wedding token for the bride and groom-to-be to store their wedding outfits. This entry was posted in Wedding Store and tagged Clothes, Hangers, Luxury, Wedding by Formal Affair. Bookmark the permalink.